Albany is the capital of the U.S. On your second day here, identify plant and animal life at Albany Pine Bush Preserve and then admire the majestic nature at Mount Greylock State Reservation. To find ratings, reviews, where to stay, and tourist information, you can read our Albany trip maker website . Geneva, Switzerland to Albany is an approximately 13.5-hour flight. You can also do a combination of flight and train; or do a combination of flight and bus. You'll gain 6 hours traveling from Geneva to Albany due to the time zone difference. In August in Albany, expect temperatures between 32°C during the day and 19°C at night. Finish your sightseeing early on the 3rd (Sat) to allow enough time to drive to Niagara Falls. Niagara Falls is known for nature, casinos, zoos & aquariums, shopping, and trails. Your plan includes some of its best attractions: explore the fascinating underground world of Cave of the Winds, hike along Devil's Hole State Park, make a trip to Third Street Art Alley, and tour the pleasant surroundings at Niagara Gorge Trail. To find where to stay, maps, reviews, and tourist information, go to the Niagara Falls road trip planner. Traveling by car from Albany to Niagara Falls takes 5.5 hours. Alternatively, you can do a combination of flight and train; or do a combination of train and flight. Expect a daytime high around 31°C in August, and nighttime lows around 19°C. Wrap up your sightseeing on the 6th (Tue) to allow time to drive to Cleveland. On the 7th (Wed), explore the activities along Lake Erie Bluffs, tour the water at your own pace with Breakaway Excursions, and then take in the architecture and atmosphere at St John's Cathedral. On the next day, identify plant and animal life at F.A. Seiberling Nature Realm, then explore the world behind art at The Cleveland Museum of Art, and then make a trip to Hope Memorial Bridge. For reviews, more things to do, traveler tips, and more tourist information, go to the Cleveland itinerary planner. You can drive from Niagara Falls to Cleveland in 4 hours. Other options are to take a bus; or take a train. Traveling from Niagara Falls in August, you can expect nighttime temperatures to be a bit warmer in Cleveland, with lows of 22°C. Cap off your sightseeing on the 8th (Thu) early enough to go by car to Indianapolis. On the 9th (Fri), test your team's savvy at popular escape rooms, then meet the residents at White River State Park, and then admire all the interesting features of Victory Field. To see maps, traveler tips, reviews, and other tourist information, refer to the Indianapolis online route builder . You can drive from Cleveland to Indianapolis in 5.5 hours. Alternatively, you can fly; or do a combination of flight and bus. In August, plan for daily highs up to 34°C, and evening lows to 21°C. Finish your sightseeing early on the 9th (Fri) so you can travel to Damascus. Damascus is a town in Washington County, Virginia, United States. Kick off your visit on the 10th (Sat): don't miss a visit to The Art Depot, ride a horse along Virginia Creeper Trail Club, and then hike along Virginia Creeper Trail. To see more things to do, other places to visit, photos, and tourist information, read our Damascus route website . You can drive from Indianapolis to Damascus in 7.5 hours. Alternatively, you can fly. August in Damascus sees daily highs of 32°C and lows of 21°C at night. Finish your sightseeing early on the 10th (Sat) so you can travel to Charlottesville. Start off your visit on the 11th (Sun): take in nature's colorful creations at Thomas Jefferson's Monticello, learn about winemaking at First Colony Winery, then steep yourself in history at James Monroe's Highland, and finally experience rural life at Carter Mountain Orchard. Planning Charlottesville trip won't be overwheling when you use's Insprock itinerary maker. Getting from Damascus to Charlottesville by car takes about 4 hours. Other options: fly. In August in Charlottesville, expect temperatures between 34°C during the day and 21°C at night. Finish your sightseeing early on the 11th (Sun) to allow enough time to drive to Virginia Beach. 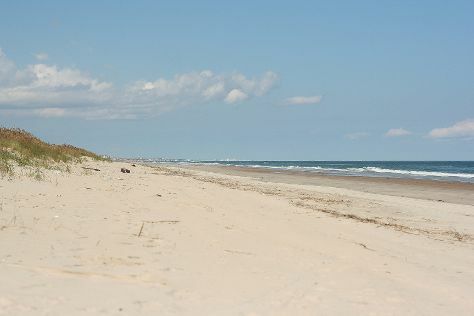 Start off your visit on the 12th (Mon): enjoy the sand and surf at Virginia Beach and then stroll through Sandbridge Beach. To see maps, other places to visit, photos, and other tourist information, you can read our Virginia Beach trip builder site . You can drive from Charlottesville to Virginia Beach in 3 hours. Alternatively, you can take a bus; or do a combination of flight and taxi. Traveling from Charlottesville in August, plan for somewhat warmer nights in Virginia Beach, with lows around 26°C. Finish your sightseeing early on the 12th (Mon) so you can drive to Chincoteague Island. Start off your visit on the 13th (Tue): explore the wealth of natural beauty at Chincoteague National Wildlife Refuge. To find traveler tips, photos, ratings, and tourist information, read our Chincoteague Island route planning website . Traveling by car from Virginia Beach to Chincoteague Island takes 2.5 hours. Alternatively, you can take a bus; or take a bus. August in Chincoteague Island sees daily highs of 34°C and lows of 23°C at night. Finish your sightseeing early on the 13th (Tue) to allow enough time to travel to Philadelphia. When in Philadelphia, make a side trip to see Longwood Gardens in Kennett Square, approximately 52 minutes away. There's still lots to do: admire the masterpieces at Philadelphia Museum of Art, meet the residents at Philadelphia Zoo, see the interesting displays at Please Touch Museum, and ponder the world of politics at Independence Hall. To see maps, ratings, and tourist information, go to the Philadelphia trip itinerary builder tool . Getting from Chincoteague Island to Philadelphia by combination of taxi and flight takes about 3.5 hours. Other options: drive; or do a combination of taxi, bus, and train. Expect a daytime high around 34°C in August, and nighttime lows around 24°C. Finish your sightseeing early on the 16th (Fri) to allow enough time to take a bus to New York City. New York City is known for museums, nightlife, shopping, historic sites, and parks. Your plan includes some of its best attractions: go for a walk through Central Park, take a stroll through Times Square, make a trip to 9/11 Memorial, and explore and take pictures at The High Line. For where to stay, other places to visit, photos, and tourist information, refer to the New York City road trip planning app . Take a bus from Philadelphia to New York City in 1.5 hours. Alternatively, you can take a train; or drive. Expect a daytime high around 34°C in August, and nighttime lows around 25°C. Wrap up your sightseeing on the 20th (Tue) early enough to travel back home.